6:30AM Connie was able to locate both fledglings #1 and #2 ( fledged April 28 and 29) by keying on their rasping food-begging cries. Surprisingly, both fledglings were located close together, high in the canopy of the hackberry tree south of the nest box (as of yesterday morning, #1 had been roosting in a different hackberry about 70 feet north of the nest box). This indicates how quickly the fledglings are developing abilities to make short flights and move among trees. The female parent was roosting a few feet from the two fledglings, on the same hackberry limb. 7:45 PM. In the nest box, the remaining two owlets were jockeying for position at the entrance. 8:14PM. Owlet #3 fledged, stepping right out onto the exterior perch, and hardly pausing before climbing sideways up the “walkaway branch”. Six minutes later, Owlet #4, perhaps the smallest and youngest, hopped tentatively onto the external perch, flapped uncertainly while keeping one wing clamped to the security of the entrance hole, then finally turned and re-entered the box. Apparently it was too scarey outside! (video). #4 eventually climbed back up to perch in the entrance, where he was fed four times by bug deliveries from the male parent. The feeding may have removed some of the motivation for leaving the box. By 9pm, it was apparent that #4 was going to have to spend one more, lonely night in the box. 10:00PM, Cockroach delivered to #4 by the male parent. 10:04, Gecko delivered to #4 by the male. 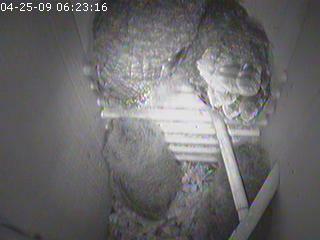 6:30-6:50AM, remaining nestlings have their heads out, and their squabbles inside the box. The male has been delivering insects to whichever one is in the entrance; working the driveway branches; the bugs are crunchy ( can hear it when the male stops on a branch to transfer the bit from talons to beak before delivering). Every once in a while I see the female up in the mid canopy, above the level of the nestbox; she isn’t hunting. I think she is keeping an eye on the fledged owlet. 9:00AM This morning we were astonished to see that Owlet #1 had moved three trees to the west, presumably by flap-hopping from branch to branch. We don’t know what motivated this 70-foot trek. Owlet #1 spent all day in a foliage roost, near the top of the hackberry tree which hangs over the garage/shop. She/he was noticed by bluejays and by a flock of sparrows, but surprisingly, none of these birds showed particularly loud or aggressive mobbing behavior towards the owlet. The parent owls continue to use the same foliage roosts they’ve been in for the last week; Madame is in a hackberry about 28 feet south of the nest box. Monsieur is in the grapevine (“Football roost”) outside the upstairs shop, about 35 feet north of the nest box. 7:45 PM. 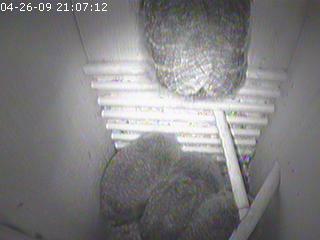 In the nest box, two of the three remaining owlets are jockeying for position in the entrance. The littlest owlet (“Digger”) is poking around in the nesting material, as usual. 8:03PM. Even Digger has gotten up on the perch and is fighting to get a head into the entrance. 8:28 PM. Owlet #2 fledged. Spent only a short time on the exterior perch, before climbing sideways up the “walkaway branch”. A parent owl visited it (perhaps fed it) just before it exited onto the main oak branch and started climbing upwards, following the same route pioneered by #1, last night. In the nest box, the two remaining owlets jockeyed visciously for position at the entrance (vid), and were fed at least twice (probably by the male). At 9pm, we were unable to locate the new fledgling with binocs, but C’s presence on the driveway elicited a bill-clap from one of the parents. 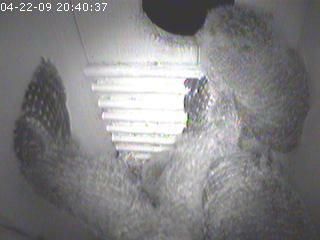 At 9:28PM, all is quiet in the nest box..
AM, T=68, extreme rain event. Flooding esp in W and NW Houston. Thunder and lightning forced us to turn off the computer in the wee hours. When we checked again at 5:40AM we found all 4 owlets still in the nest. Periodically, one owlet (“Ms Piggy”) would be in the entrance, and one other owlet likes the back perch. 6:40A, Adult owl strafed a squirrel on the trunk of the nestbox tree, with bill claps to show annoyance. Female is roosting in the hackberry branch behind the nestbox. 11:00AM, Female is in the nestbox—don’t know why or when; didn’t see her arrive. 11:08A, Female exited nest box. We are expecting fledging any night now. The oldest owlet hatched 29 days ago, which is about the average residence time for nestlings. 8:10ish Furious flapping and fighting for position in the hole (video). Chaotic. All four on perches at one point. Two owlets jammed into the hole; one on left almost out of the box. 8:22 Owlet fledged! #1 (as we called this intrepid pioneer) popped out of the entrance hole and spent nearly 5 minutes on the external perch, swaying in the gusts of wind and bobbing its head, before climbing sideways and upwards on the “walkaway branch” which had been arranged to connect with the main branches of the nest tree. One of the parent owls paid a brief visit to the owlet (could not see if there was an edible treat involved) before it finally flap-hopped up onto the main oak limb. It proceeded to climb upwards on the oak, flap-hopping over small obstacles and stopping to rest on convenient twiggy perches. Hard to imagine how this fledgling deals with having to climb a 100-foot mountain, when its previous climbs were limited to 6 inches, up and down inside the box. That’s what all that exercise on the front ladder was good for! 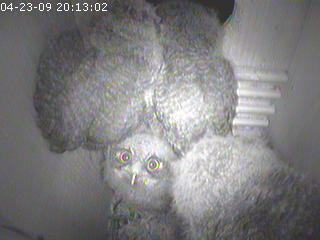 Back in the nest box, the remaining three owlets suddenly got very quiet. “Omigosh, where did Sis just go?” In a minute or two, an owlet on the floor jumped up to join the one still looking out the hole. Two were still looking out quietly, one on floor, at 8:35pm. Owlet on right of hole rasping persistently (you can tell because his tail shakes)—others silent. 8:45pm Food delivery, apparently, to an owlet looking out the hole. Climbed back in the box with the prize. Couldn’t see what it was. We think that it is the male owl who is continuing to delivery groceries to the nest box, while the female owl attends to the fledgling out in its brave new world. 8:26pm Another food delivery to owlet in hole. 8:50pm More food to owlet in hole. 8:55 Owlet #2 who had been in the hole left the box, then climbed back in (photo). 9:08 & 9:11 More food to the same owlet—I don’t think the other two have had a bite. 9:12 Finally, another owl has figured out to join his sibling at the hole (food trough). Hope he gets something to eat. 9:23 Owlet #2 relinquishes her/his primo spot in the hole to a sibling and takes to the top perch for some personal feather grooming. 9:27 Owlet in the hole gets his first food delivery. Good! 9:29 No one at the hole. 9:32 Parent delivers food to—unbelievable—the piglet on the perch. AM, nestling in the opening and sometimes one on the back perch. F is in the hackberry roost behind the box. PM, Heavy rain at around 7PM. We weren’t home but watched owls from a distant computer. Standard configuration seemed to be evident, with a pig in the hole and impatient siblings in the background. No one fledged tonight, perhaps b/c of bad weather. Owlet in the entrance, some insect deliveries. F went to the grapevine roost near the shop, M to the hackberry behind the nestbox. 7PM, windy, high humidity, sprinkling; both M and F are in the grapevine arbor, the M in plain sight. Tried to get a picture but the light is too low. 8:00-8:20PM, adults along the driveway, some insect deliveries; I am watching from the window; T and KAS are receiving and chatting, and, as I find, not recording a darn thing. Sluggards. So hard to find good help these days. 8:48P, 8:55P, 8:56P, deliveries to the chick in the entrance; the others have abandoned hope and are sitting on the floor. Just fledge the bum. 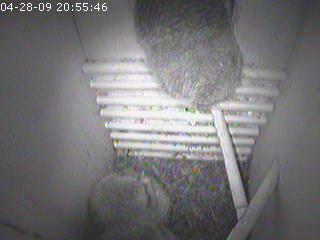 9:00PM, all is quiet in the nest box. One owlet, the piglet, remains in the entrance, blocking food deliveries and air to her siblings. Til 10:30P, a few more insect deliveries; Pig eventually joins her fellow nestlings on the floor of the box for some shuteye. 6:00A, we can hear the male trilling (montonic) from somewhere outside the box but so far there have been no food deliveries. The owlets are active, hearing this. 6:21A, One owlet in the entrance, one climbing the ladder; still no sign of an adult at the box. 6:32AM. Adult owl (male?) appeared on the Honda Branch, holding the carcass of a small bird in his talons. After eating a bit of the bird, he flew to the nest box, where one of the owlets was perched in the opening. He may or may not have fed a mouthful to the owlet in the entrance (the cam image from inside the box was not conclusive), but he did not deliver the bird carcass to the box, because a minute later, he was back on the Honda Branch, still carrying the bird. The adult owl made one more trip to the nest box, still carrying the carcass, but with same result: no delivery. Did he intend to deliver the carcass, but was non-plussed by the presence of the owlet in the entrance, and unable to come up with “Plan B” ? Or are the adults starting to taper down on feeding, to encourage fledging of the hungry owlets in a few days? At any rate, the owlets are pretty darn hungry inside there. Male went to his roost at 6:45A, at least, I think it is the M; looks big from the driveway. The other owl is roosting, we think, up higher in the same tree, behind the box. Haven’t found it visually yet, though. 8:03pm (from C, outside) M and F both perched on the Honda branch; the F has something large in her claws that she is ripping at—probably a bird. She fed a bit of it to the owlet hogging the entrance. 8:16P Owlets (mostly one) still tearing at and eating the previous delivery. 8:17P Food delivery. Large owlet seems to be trying to swallow a feather or bone from 8:03 delivery. 8:23P One owlet’s head is moving side to side, watching the entryway like a mesmerized cobra. 8:30P Food delivery. Chicks had been very silent and still, staring at the entryway, for several minutes. 9:05 Finally! Thump on outside perch. Bill-bumping duel between two owlets. Bug delivery! 9:07 Another bug. 9:11 Another delivery, and an owlet climbed back into entryway. He got the 9:12 delivery, which generated bill clacking from a sibling. 9:19 good night from me (KAS)—thanks for letting me watch! 10:17PM, bird fragment dropped into the nestbox by a parent; owlets must be able to tear it up by themselves now. 10:20-23P, 2 insects; one, from the M, got stuffed down the already full gullet of the piggy owlet; the next one was snatched by its hungry sibling. 10:27P, frustrated male finally drops his bug offering on the floor b/c none of the kids are paying attention to him. 6:26A, There is an owlet all the way up in the entrance. All previous tries have been hanging from the beak and talons, but this one is actually perched on the entrance hole. (picture) Whooeee! Watch out, we don’t want an inadvertant fledging event. 6:39A, M flew to the Honda branch, then to the box w/and insect. I have been checking the owl bath to see if anyone is there. Not so far, but I hear cardinal chipping from the pool west of us, so maybe the owls are using the more elegant facilities over there. 6:49A, F flew up the driveway to her roost tree east of the shop. 7:30A, f is in the box, head out, but not for long. 5:15PM. Owlets were doing wing-flap exercises and generally getting in each other’s way. The smallest (youngest?) owlet is pursuing his private vocation for digging furiously through the nesting material, covering his incredulous siblings with debris (video). Last year, also, we noticed that the smallest owlet became Digger. Could mining the nest material for small beetles, other insects, and overlooked food scraps help to compensate for his height disadvantage during the usual parental grocery deliveries? 7:00PM Owlets quiet, thunderstorm approaching. 7:17PM, Rain is falling and thunder is continuous. How will this affect feeding time tonight? 7:29 First food delivery: a lizard. This is early. All the owlets are now cranked up and rasping loudly. 9:50-10:25P, nestlings are very quiet, heads down and recumbent. Raining again, and no food deliveries. Bed for me. 6:23AM, 6:24AM, Insect deliveries. The intrepid climber on the back corner perch was pissed that she was too far from the entrance and missed the bugs. At 6:27AM, when I walked down the driveway, both parent owls were sitting side by side on the Honda Branch. When I walked beneath them, the male flew to the crepe myrtle. There were a couple of bouts of high spirits this afternoon among the chicks. We have a digger, who sprays shavings everywhere, digging for what I don’t know. 8:14PM Owlets jamming the doorway, one on the back perch. (picture) The ones in the entrance are peering outward intently, waiting for the first food delivery, which was 8:14PM. Many insect deliveries b/w 8:15 and 8:55PM. I sat in the driveway to watch—M and F were hunting both trees and ground all along the driveway, from the Evan’s back porch light to the crepe myrtle. Couldn’t hear owlet noises even though I was 35’ from the box. No birds or large carcases. No owl activity of note. The owlets had a brief period of activity—climbing and flapping, then settled down. Parents are in their usual day roosts. The chicks are steady on their feet and are starting to do a lot of directional bobbing—the way you move your head back and forth to see better out of a window screen, for human example. 7:55P, Female came to the box from her roost. Just checking. Got the chicks revved, though. 7:59P she landed on the ext. perch and trilled several times. Babies started climbing the walls—literally. One was on the ladder, another actually got to the opening. I hope I caught that on video. Internet connection has been having a Comcast Day, so at the moment the ‘server is not found’. 8:12P, more acrobatics in the box; up the ladder, hang by one foot, bite the entrance hole and drag yourself up; make a 5.9 move to the perch but land on your brother’s head instead. 8:14P, probably the funniest thing I have seen yet: male arrives w/an insect; the ravenous owlet on the inner perch can’t reach that far, the hungry owlet at the door is facing the wrong way with his mouth wide open, the other two are trampled underfoot. After a confused moment the male leaves again—with the insect. 8:35P, insect delivery—a cockroach; there are 2 on the inner perches and the front one is getting it all. The star, the one who made it first to the back perch, is coming up empty in the food department. Ah! Cockroach on the loose inside the box! The perched ones are desperately trying to score but it is one of the little ones on the floor that finally nails it. 851P, bug delivery by the F; she has to come down into the box to feed it to one of them. There haven’t been that many delivered tonight , and of what I have seen, one owlet has gotten the most, and the chick on the perch has had nothing. I suspect it doesn’t know how to get down. 11:15PM. An owlet is choking down some big, winged insect. I’m going to have to stay up in case a Heimlich is required. 6:20AM, Female was not in the box. Lots of mosquitos buzzing owlets. Raccoon went up the computer-room oak tree onto roof of our house, with Addy hissing and huffing at it through the window. 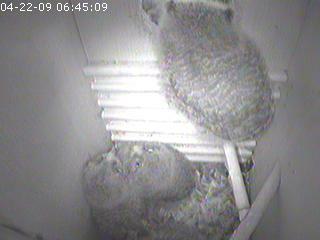 Owlets look bored and are experimenting with biting the perch and front-wall “ladder”. 10:30AM, Male in his daytime roost behind the nestbox; female in the nestbox; chicks displaying increasing cabin fever (2009 video: “cabin fever”). 4:45-5PM Just in the course of this single day the owlets have learned how to manouver into the upper reaches of the box. (2009 video: “staying on top”) They use their beaks and talons like parrots to climb. To my astonishment one of them has actually managed to flap and bite his way to the upper inner perch, and another at the same time got his head into the box entrance by clawing and clamping his way up the ladder. We are now in some slight danger of losing an adventurous chick right out of the entrance. They are fascinated with the view of the outside world, waving and swaying, and so bright. 8:10 to 8:45PM, innumerable insect deliveries by both parents. Finally the chicks retreated one by one to the back of the box and none reached up for the bug tidbits. So now, 8:56PM, the parents have quit delivering. 10:30P, chicks all have their heads down; at least one is tearing at something—might have been a bird delivery during our absence; the rest are hiding from the mosquitoes.